New documents revealed show that KROLL the global security giant whom were brought in to protect the reputation of a board member of the worlds largest reinsurance company, Guy Carpenter Limited whom Ian Puddick had exposed for misusing company expenses, had put Ian Puddick under a massive secret surveillance under the code name ‘Operation Marten’. The documents reveal that Kroll had obtained a High Court order to monitor Ian Puddick’s mobile phone. 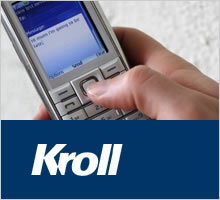 Ian’s movements were then triangulated to ensure that undercover Kroll operatives were able to keep tabs on him, it does not show how Kroll obtained any lawful authority to triangulate Ian’s phone, however it is clear from other Kroll emails that Kroll had a very close relationship with very senior officers at City of London Police. In a sinister turn, Kroll documents show that Ian Puddicks mobile phone sent out abuse text messages on the evening 6th Thursday August 2009. The mobile phone clearly identifies Ian’s mobile phone location at his home in Palmers Green. Ian happened to be nearly 100 miles away in Lewes, East Sussex at a meeting. This is confirmed by the Company secretary and approx 15 other people.